It was a foregone conclusion that shares of Avenue Supermarts Ltd, which runs the D-Mart supermarket chain, would list at a huge premium on Tuesday. But a 115% appreciation is taking things too far, notwithstanding the pedigree of the company. At Tuesday’s closing price of Rs641.60, the D-Mart stock trades at 77 times estimated earnings for fiscal year 2016-17 and 55 times one-year forward earnings. “Valuations are certainly expensive; the euphoria around the listing is driving prices," says Arun Kejriwal, director of Kejriwal Research and Information Services Pvt. Ltd.
On an EV (enterprise value) to Ebitda basis too, valuations are sky-high at around 31.6 times, based on IIFL Institutional Equities’ FY18 estimates. Ebitda stands for earnings before interest, tax, depreciation and amortization. “I find it very difficult to buy D-Mart at this valuation. It reminds me of the heydays of retail stocks," says a fund manager. Nevertheless, the absurd valuations may well sustain, given a dearth of quality stocks and investors’ admiration for the company’s promoter, who is an ardent investor himself. “It may take some time for the euphoria to cool down", says Kejriwal. “We expect premium valuations to sustain given strong growth and limited options to play the organised retail story in India," analysts at Prabhudas Lilladher Pvt. Ltd said in a note to clients. To be sure, the quality of the company and its superior margin profile are appealing as well. Its net margin in the nine months to December stood at 4.4%, higher than Future Retail’s mere 2% margin. And since the IPO (initial public offering) proceeds will be used to repay debt, net margin is expected to rise to about 5%, increasing its lead over other retailers. Further, D-Mart’s return on capital employed for 9MFY17 was 22.9%, higher than Future Retail’s estimated return of 12.8% for FY17. Still, should that justify valuations of as high as 31.6 times Ebitda. 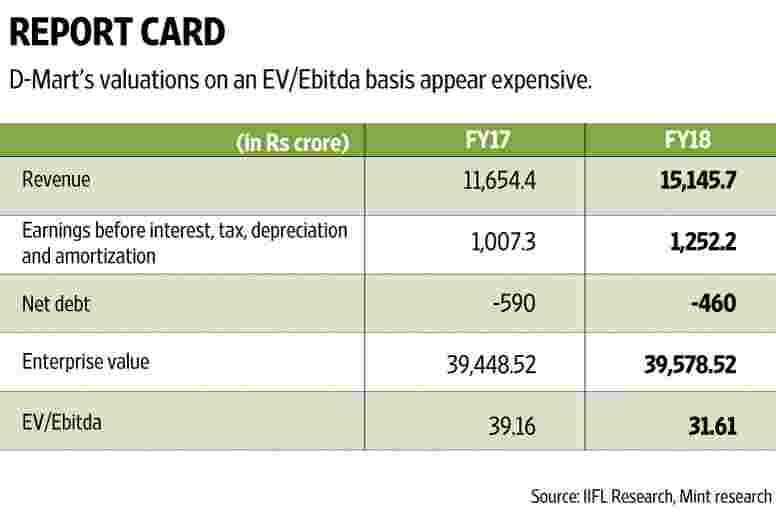 Analysts at IIFL Institutional Equities, for instance, have a price target of Rs480 for the stock, at EV/Ebitda valuations of roughly 24 times, based on its FY18 estimates. In hindsight, it’s clear that the issue was underpriced. S.P. Tulsian, an independent analyst says, “It was a goodwill gesture on the part of the company to price the issue lower and the market has rewarded it generously." But as a consequence, the company ended up raising far less funds than it could potentially have raised. The value of its free float capital has risen by around Rs2,000 crore; if it had decided to share half of the spoils by pricing the issue higher, D-Mart would have received an additional inflow of around Rs1,000 crore. That is fairly significant for a company with a balance-sheet size of around Rs4,000 crore. While the good taste of the spectacular listing may linger for some time, investors would be keen to know whether growth rates will persist. More recently, revenue growth has slowed. For FY16 and FY15, revenue growth was 33% and 37%, respectively, year-on-year. That is lower than the annual revenue growth seen in the preceding two years. It’s also worth remembering that D-Mart’s quarterly financial results history and the impact of seasonality, if any, is not known to the Street yet. Those factors are worth watching for the stock along with other factors such as same-store sales growth. And finally, with valuations so high, there is hardly any room for error on any of these counts.